A globe is a three-dimensional model of the very planet we live on and a mighty staple of many schoolrooms and museums. Of course a globe doesn’t have to represent our planet earth, a globe can be of any spherical celestial body, be it in space or in our imaginations. A globe generally depicts the surface features of a planet or moon and can allow for detailed study of topological formations, geologic structure, and even the record of cosmic impacts. It could also be an astronomical (known as “celestial”) globe, which depicts the celestial sphere of antiquity with apparent positions of stars and constellations as if they were projected onto the surface of a sphere. Globes are nothing new, though. The sphericity (roundness) of the earth was talked about as early as the sixth century BCE and firmly established in the third century BCE thanks to Greek astronomy (sorry, flat-earthers). In short order, globes began appearing: the first known example in the second century BCE. The earliest surviving terrestrial globe is the Erdapfel from the early 1490s, which does not yet show the western hemisphere (that wouldn’t appear on globes for another decade). For at least 2,200 years, depicting the world on which they live in the round has fascinated humans, and the results can be absolutely stunning. The largest man-made globe in existence is the Unisphere in Queens, New York built for the 1964 New York World’s Fair. Some of the most beautiful traditional globes still being made come from Bellerby & Co Globemakers in London. Completely hand-painted and bespoke, the largest globe Bellerby makes is the massive Churchill, which is more than four feet in diameter and resting on a large turned oak base; it dominates the room and the senses. That specimen is an example of how globes are a visceral experience for many people, a powerful, visual, three-dimensional reminder of the small spaceship we call earth and our home in the universe. That is why when the incredible craftsmen that make watches need to display time zones or relative day/night, a few brave and talented souls also sometimes reach for the globe. Most of these miniature examples wouldn’t be considered globes, but planetary domes, yet a similar function can still be served. As such, the miniature globes capture the eye, providing an overview effect that just can’t be obtained from flat, two-dimensional maps (paper or screen). They are a favorite among collectors for the artistry and functionality they provide. The Sauterelle à Heure Mondiale is an extension of the awesome Sauterelle line that sees the moon phase indication, which is usually at 7 o’clock on the dial, replaced with a miniature earth: a half dome rotating over 24 hours to show day and night and a GMT or second time zone. This new model is first and foremost a GMT watch, perfect for travelers or those doing business across time zones. The dial is used (as usual) to display local time, while the globe continuously shows the time wherever you set your home time. 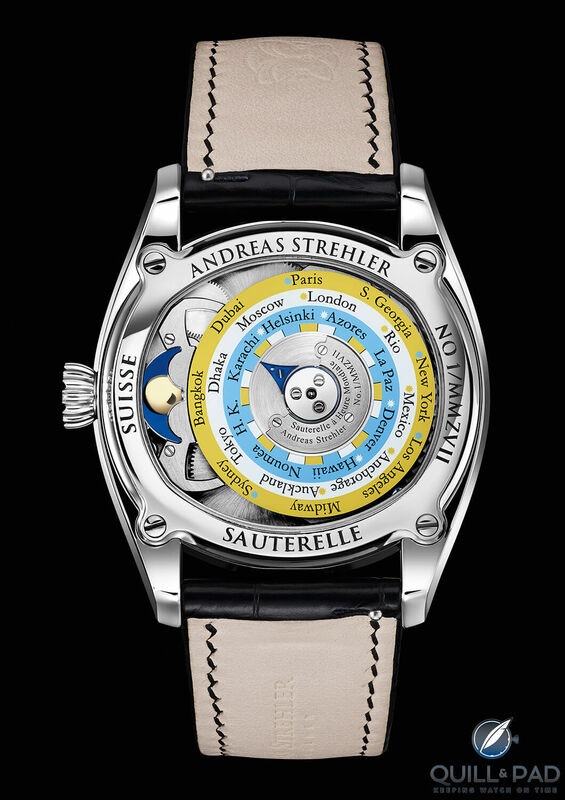 The rear of the watch features a large city disk with 24 major cities, each representing the main hour-based time zones. A central blued steel hand is tied to the time display on the front, so that when traveling you can adjust the hours (independently so as to not affect the timekeeping) and the city disk will update automatically. To set your home time (or GMT if you prefer), you pull the crown to its first position and adjust the blue indicator to the city that corresponds with your local time zone. Then you turn the watch over and pull the crown to the second position. Here you adjust the time using the miniature globe as a reference for day or night. The globe is placed underneath a sapphire crystal minute ring, and the area covered by the ring is the portion of the earth currently experiencing nighttime. Once the time is set in your local time zone and the globe is in the proper orientation, you can push the crown back in. Next, when you travel, you simply need to pull the crown out to the first position and change the hours, independently as stated before, and the correct time zone displays on the rear while the globe continues to indicate the home time thanks to a 24-hour ring surrounding the miniature earth. The easy functionality and the miniature globe make for a lovely display that is simple to use even if the mechanics behind it aren’t so simple. This is, after all, a Sauterelle. That means it features Strehler’s patented remontoir d’égalité, consistently doling out a steady supply of energy to the balance to create a constant force for higher precision timekeeping. The remontoir d’égalité is, in my opinion, better than a tourbillon for visual interest because while a tourbillon moves constantly, the jumping action of the constant force mechanism is much more engaging all while being more functionally important than a tourbillon. But it doesn’t stop there. Since Strehler is the astronomical genius he is (not to mention modest), he wouldn’t let his two-million year moon phase indication be pushed out just for the GMT function, so he tucked it into the rear of the movement, just next to the time zone city disk. A polished gold moon on a blue disk, it peeks out from behind a bridge subtly shaped like butterfly wings (a familiar shape in Strehler movements). And that is a nod to the beauty that Strehler likes to add to everything he does. Some individual watchmakers might have a tough time designing watches that don’t look just like highly technical mechanical constructions instead of beautiful watches, possibly due to the fact that their backgrounds are in watchmaking and not design. Of course, I absolutely love mechanics so that style fits right into my wheelhouse, but Strehler fits into another area that I love: well proportioned, intuitively designed watches that also happen to be mechanically impressive. Not every watch should look like an Urwerk or an MB&F and at the same time not every watch needs to look like a Patek Philippe, either. 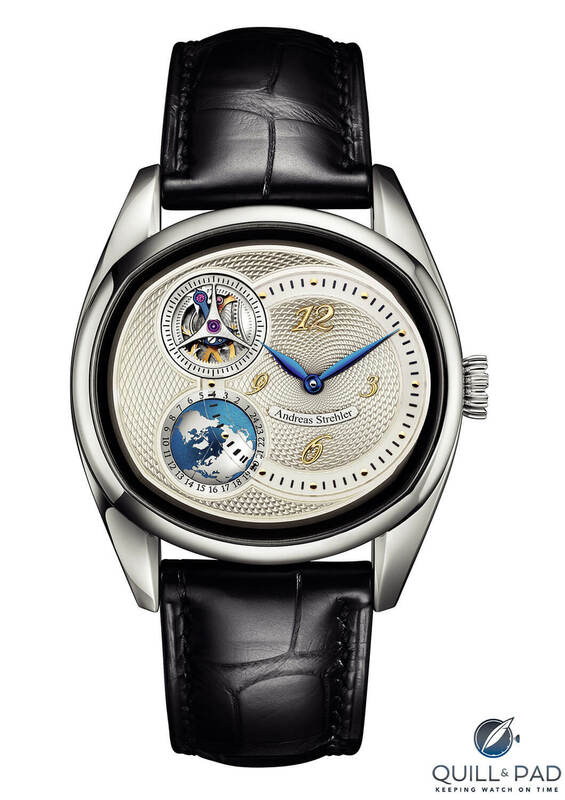 Strehler has a unique style, something leaning more toward the classic end with guilloche dials and refined details. But the addition of the remontoir d’égalité on the dials of the Sauterelle pieces and the extravagant skeletonization of the Papillon watches helps push them into the realm of mechanical constructions. The Sauterelle à Heure Mondiale is a more classic watch that still satisfies the movement lovers among us. The choice of incorporating a GMT with a planetary dome and adding indications to the rear turns the watch into more than just the sum of its parts. Not to mention that after spending so much time focusing on the incredible moon phase, it is awesome to see Strehler take a new direction providing more complications to play with. The globe is a fantastic choice and might result in even more interesting ideas now that there are more elements to work with. 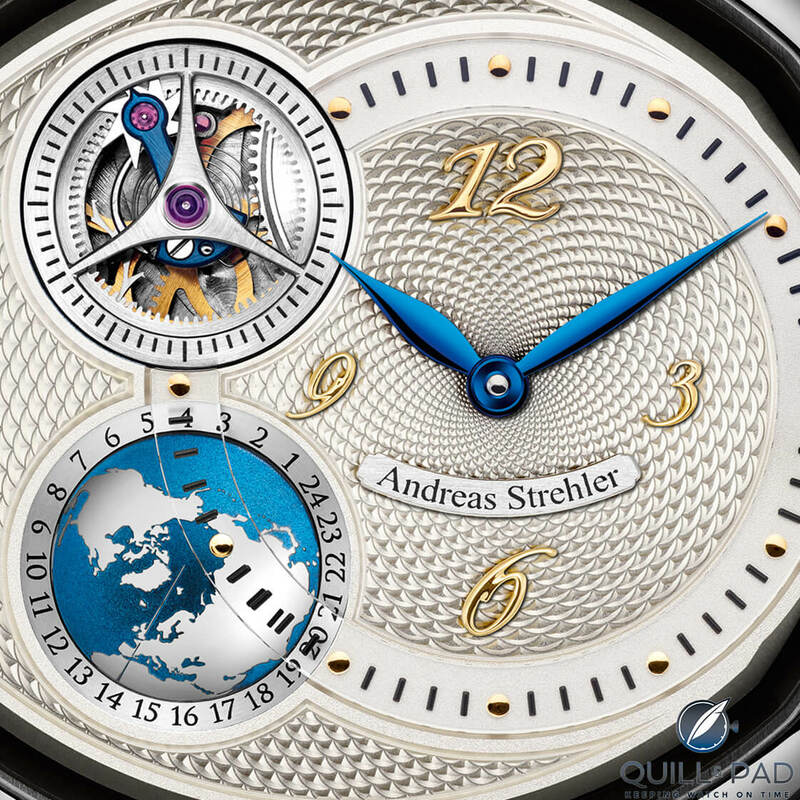 The Sauterelle à Heure Mondiale is another exemplary watch from Strehler! Since I probably have some time now, how about that breakdown! Wowza Factor * 8.65 When you know something is a Strehler you are primed for something reserved yet awesome, and the Sauterelle à Heure Mondiale does not disappoint! Late Night Lust Appeal * 95.45 » 936.044m/s2 It’s almost like the weight of the world holds you in your chair until the wee hours fantasizing about this watch! M.G.R. * 69.9 You know the movement is awesome when a two-million year moon phase is a secondary feature on the rear of the movement. Added-Functionitis * Moderate Moon phases and GMTs are enough to require prescription strength Gotta-HAVE-That cream for the particularly spherical swelling! Ouch Outline * 11.1 Aluminum foil touching a couple of your fillings in your teeth! Yikes! For anyone that has never had the metal fillings, consider yourself lucky enough to never experience such a weird and uncomfortable feeling; it gives me shivers just thinking of it. But if I had to do it again for a chance to get this on my wrist, well, I wouldn’t even hesitate. Mermaid Moment * The first time you switch time zones! Easy manipulation of a second time zone is more than enough reason to elope! Awesome Total * 696 Multiply the number of parts in the movement (206) with the consistent frequency of the balance in Hz (3) and then add the number of hours in the power reserve (78) for a surprisingly incredible awesome total! For more information, please visit www.astrehler.ch/sauterelle-heure-mondiale.